In this article of the series, I’m going to show how we can manage our Azure Account by using Azure PowerShell ISE, by which we’ll see how we can perform different operations on storage and the same also with Azure Explorer. 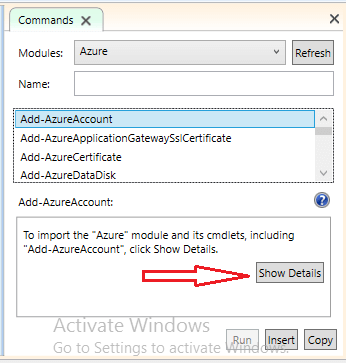 There are some commands that help access the Azure Account. It is a Windows based GUI and framework from Microsoft. It has a predefined set of commands along with non-scripting language. PowerShell is a Command-line Shell which is similar to the command window, interactive editor built on .Net framework. When we are writing scripts on PowerShell, we have complete access to entire .NET framework, such as all the classes, different methods, and data types. 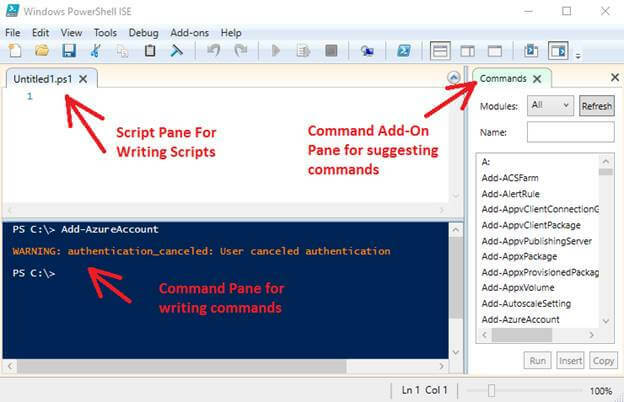 PowerShell ISE has Commands Add-on Pane which helps in easily creating different scripts having to type all the commands in the command line conveniently. Along with Commands Add-on Pane, we have script pane for writing the scripts, and Command Pane. You can toggle the script and commands On and Off from the View menu. With the help of Command-Add-On Pane, you don’t need to type any command on Command Pane, just select the command whatever you want to run from Commands Add-On Pane and run it. Commands Add-On pane has several properties to perform your commands. 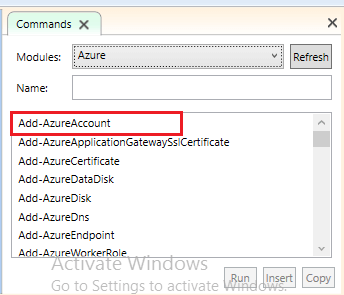 For example – if you want to work only with Azure Storage Account, then just select Azure.Storage from the module. 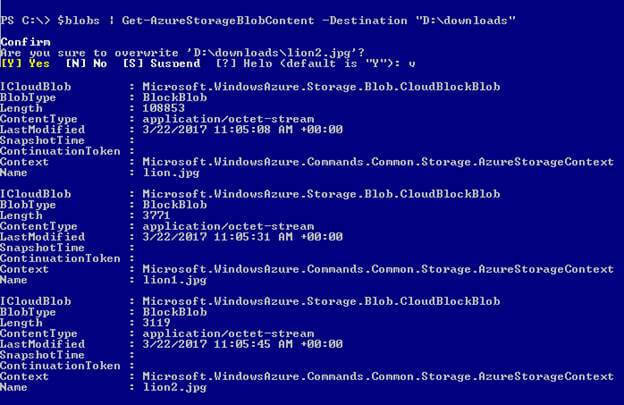 Then only, the list of Azure Storage commands is shown on your screen. You can write the module name in the Name section whatever you want to work with. 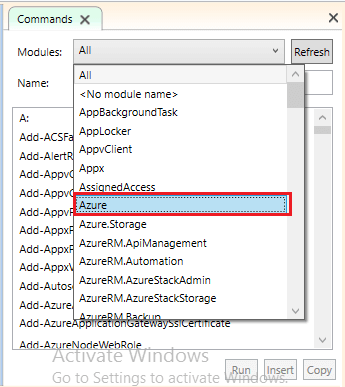 Let’s assume if you select Azure.Storage module and want to perform a command from the available list, just select it and click on to Insert. It will ask showing parameters – just click on Run to run a command. Well, the PowerShell ISE is installed by default with Windows 10 when you’re installing PowerShell from SDK. 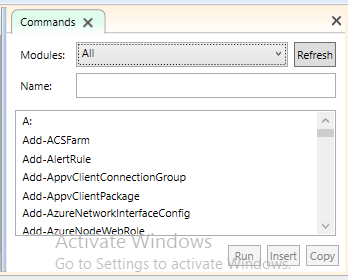 In modules, select Azure. Click on Show Details to add parameters. Click on insert to insert command on Command pane, and click on Run to run the command. 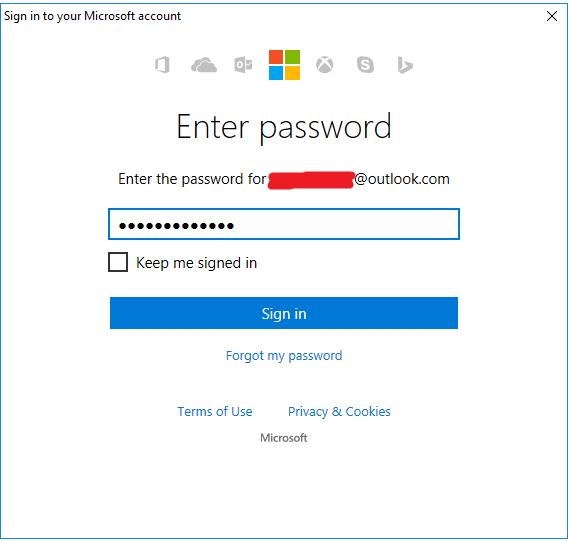 That will open a page for Microsoft account. Enter your credentials to add account with PowerShell ISE. 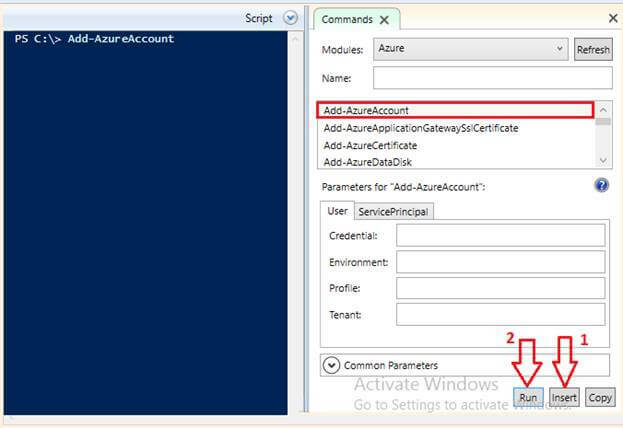 When your account will be added then PowerShell returned your Azure account Id to ensure that you’re connected. If you want to read all commands then you can run a command to show a list of commands with description. Create a new storage account. For creating a new Storage Account give a storage account name (lower letters) and your specific location where you want to create account. 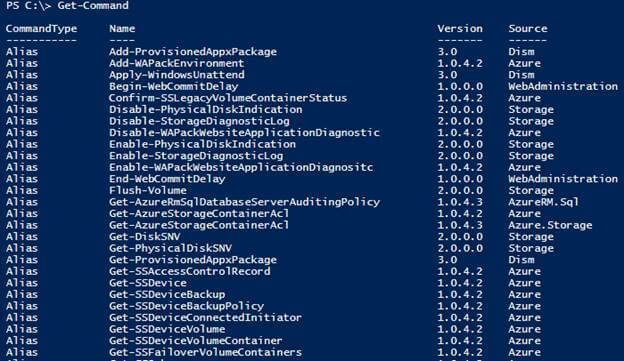 Get your Storage Account details on PowerShell cmdlet that will return a full detail of your storage account. Check onto Azure Portal to see if our new storage is created or not. To create a new Container give a name (lower case) to your Container. In previous articles I’ve discussed that for accessing your data from containers you have to change permission for anonymous read access. If you give Permission as Off to your Container then anonymous users can’t access your data. You can set Permission to Off or Blob or Container as discussed in one of the series’ articles. Check onto Azure Portal the Container should be created. In the following screenshot you can see I’ve uploaded two different blobs into the same container. This command retrieves all the blobs that are in your Container. To delete a blob you must know the blob name as shown in following screenshot. If you want to download your blobs into your local directory then you have to write couple of commands. Create the destination directory where you want to save your items. The below screenshot shows this type of confirmation because I already have the same blobs under the same folder. 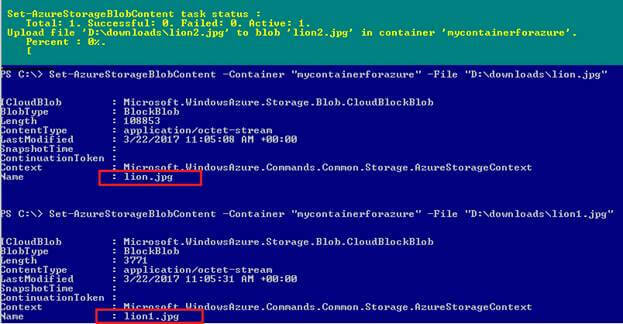 Wait for a second, it retrieves all blobs which are in Container onto PowerShell cmdlets. 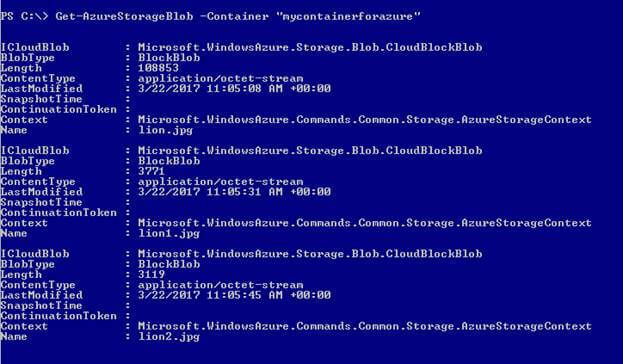 Unlike Blob Storage, you can perform commands against Table Storage, Queue Storage and File Storage on Azure PowerShell ISE.